Our January/February issue of Native Business Magazine dives into energy initiatives across sectors: oil and gas, wind, solar, hydropower, geothermal and bioenergy. This marks our third issue of Native Business Magazine—and our first-ever energy-themed issue. In these pages, we demonstrate how Indian Country is a leader in energy innovation. Aaron M. Schutt, Doyon, Limited President and CEO, is the cover subject of our January/February Energy issue. 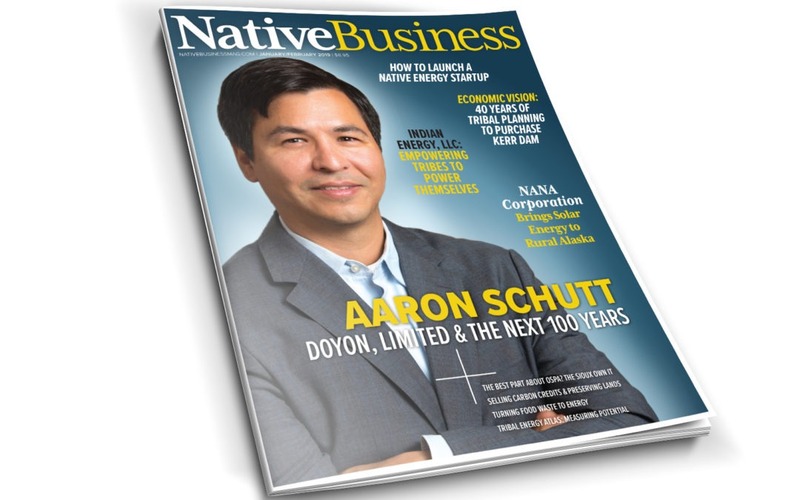 Native Business Magazine spoke with Schutt about Doyon’s substantial economic and community impact (the Alaska Native regional corporation serves more than 19,000 shareholders). He offers an overview of the scope of Doyon’s diverse portfolio of businesses—its drilling operations in Alaska’s North Slope oil fields, pipeline construction, and more—and emphasizes the corporation’s rigorous environmental standards. Schutt also talks workforce development, drawing attention to Doyon Drilling’s roustabout program that provides free training to Doyon shareholders who are interested in careers in the oil and gas industry. When it comes to pursuing energy, the stakes and rewards are high. “Energy Sovereignty will require Tribes asserting their power through responsible ownership across every applicable sector in the energy industry for the ultimate benefit of future generations of our Native people,” said Gary Davis, Publisher of Native Business Magazine. Success stories detailed in the pages of the January/February issue are intended to inspire and inform energy projects, as well as demonstrate the potential for energy development across Indian Country. “The ‘energy’ issue highlights the vast amount of energy opportunity that exists across Indian Country, shining a light on multiple opportunities for energy investment and partnerships,” said Carmen Davis, Publisher and Executive Editor of Native Business Magazine. A feature on Indian Energy, LLC, demonstrates the sophistication and innovation in the energy sector being brought forward by Native entrepreneurs. Founded by Allen G. Cadreau, a member of the Sault Ste. Marie Tribe of Chippewa Indians, Indian Energy, LLC, provides tech support to help Tribes own and operate their own energy infrastructure. Leadership and long-term planning cannot be underestimated when growing Tribal energy economies. Native Business shares the steadfast, 40-year commitment of the Confederated Salish and Kootenai Tribes to assume ownership of Kerr Dam, a hydropower facility in Montana. Native Business highlights how a partnership between the Cherokee Nation of Oklahoma and the Pipeliners Union Local 798 is training more Native welders in the oil and gas industry. The Energy issue hones in on the remote village of Buckland, Alaska, where NANA Corporation is collaborating with and empowering its local shareholders to replace sky-high utility costs with solar and wind energy. A six-tribe coalition shares their collective vision and plan to co-create a viable wind energy operation in the Plains region. Native Business breaks down how Tribes can participate in the carbon credits market. A Tribe in Northern Wisconsin reveals how they’ve successfully turned food waste into energy. In a nutshell: energy project development and investment can help Indian Country achieve self-sufficiency, build capacity, create jobs and drive economic development opportunities.